Much of the research quoted in this Paper is very recent. So far little of this research relates directly to the adolescent brain nor to the possibility that this is a time-limited adaptation, critical to how the individual will reshape its brain so shaping its capacities to deal with a problematic future. This Paper is probably unique in the claim that it makes that a proper understanding of the relationship between the change in the very young brain and that of the adolescent provides the theoretical base for a complete restructuring of formal and informal systems of education. Conventional academic research lacks a methodology able to relate these “different ways of knowing” into a coherent intellectual argument. A world of specialists is too much like the blind men of the Hindu proverb in their approach to the elephant. At that point the neurologist in Giedd stopped short. When Giedd said he was “guessing”, the limitations of modern scientific methodology demarcated as they are by the individual procedures of separate disciplines become frighteningly obvious. 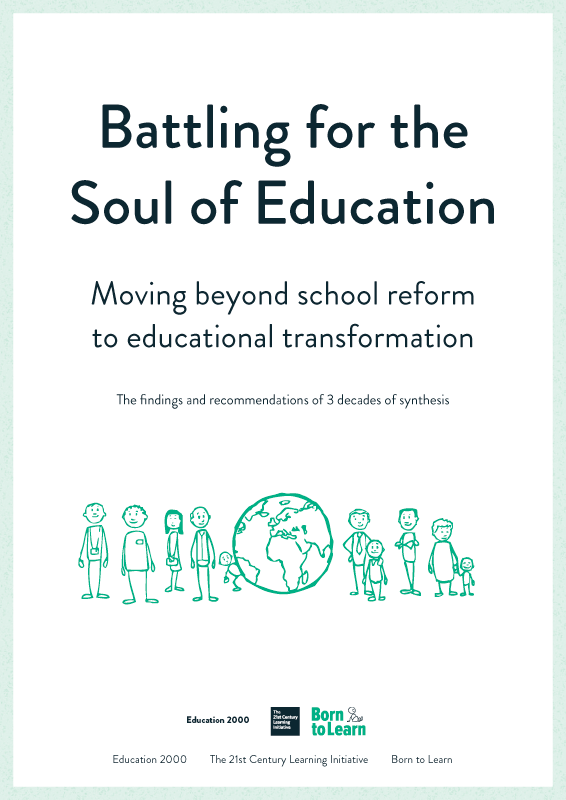 Giedd was unintentionally making the case for the synthesis which this Paper has sought to make – and which educationalists and policy makers desperately need to inform their judgments. Subject experts are overly sensitive to respecting their separate areas of expertise. This Paper argues that it will only be when enough people can intuitively appreciate the kind of Synthesis set out here that they will see in adolescence that evolutionary adaptation which society continues to ignore at its peril. To do this academics need more humility, and ordinary people need more confidence in their innate ability to see how things come together. Then society will be primed for action. It is the application of ideas that matters most to people. Consequently it has to be the responsibility of those with a gift for teasing out the detail in abstract ideas, to make their findings readily available to people of action. The separation of thinking from doing has been going on for a long time. In his classic short treatise “What is Life”, the Austrian biologist Erwin Schrodinger wrote in 1943 “a scientist is supposed to have a complete and thorough knowledge at first hand of some subject, and therefore is usually expected not to write on any topic of which he is not a master… We have inherited from our forefathers the keen longing for unified, all-embracing knowledge… the universal aspect (was what universities was set up to establish) the spread of… multifarious branches of knowledge… confronts us with a queer dilemma… it has become next to impossible for a single mind to comprehend it all. The implications of such an understanding about brain development are enormous. Every reader will wish to ponder for themselves the many issues that this Paper raises. They challenge many preconceived ideas about how education should be organized. Any careful reader will want to question the synthesis, and that is entirely appropriate. As it stands, as of January 2005, and with the information currently available to The Initiative, this is the conclusion that we have come to. Some of the research is obviously more robust than other parts and, in particular, The Initiative is well aware that much remains to be discovered about neurological changes in the adolescent brain. In time a methodology should evolve which will make it easier to create a synthesis from across different subjects, as well as between the physical and social sciences. This may happen when we allow ourselves to have greater faith in our powers of intuition.